Very often when I tell people that I rescue cats in trees, they will respond, "Isn't that dangerous?" The answer is that, yes, it is dangerous: the drive over there is dangerous, and the drive home is dangerous, but the part in between is fine. That was especially true this time, but there was also one other danger with Pepper's second rescue: lightning. When Susan called me to rescue Pepper, I almost told her that it would have to wait till the next day. I had been watching a storm front approaching on the weather radar all day, and it was now getting very close. I did not think I would have enough time to get packed and drive out there in rush-hour traffic before the storm arrived. But I said I would proceed as if I did and re-assess as I go. As it turned out, when I arrived at the site, the weather was calm with little hint of the storm that was approaching. I found Pepper about 25 feet high in the same tree where I rescued her before over two months ago. Pepper was a very easy-going, cooperative cat for the first rescue, so I was expecting the same from her this time. I set up my rope on a branch just a few feet above her knowing that it was highly unlikely that I would need to chase her higher in the tree. 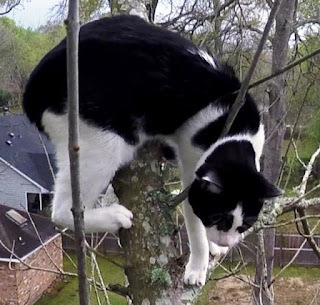 Knowing that my time was limited, I hurriedly prepared to climb the tree. That was a mistake. My movements were quick, and I walked quickly from place to place. Fast movements just make cats more nervous as they are associated with predatory behavior. I caught myself at one point and forced myself to move more slowly, but the damage had already been done. Pepper had stopped calling to us and started looking up higher. She began to make motions toward the stem next to her and eventually managed to jump to it. Then she climbed over to an upward-sloping branch and climbed up and out to get farther away from me. My rope was already installed, but now it was not in a convenient place to rescue her. I did not have time to take it down and re-install it, so I proceeded to climb up to her knowing that I would have to maneuver around several branches to get to the opposite side of the tree. After slowing down my movements, I noticed that she began to calm down even as I began to climb up toward her. In fact, she now seemed happy to see me and made some motions toward me. Pepper had gone up a branch that sloped a bit too steeply for her to go back down, so she stopped and settled in an awkward position standing on some small limbs. She could not come any closer to me, so I needed to get closer to her. I pulled myself around the two stems and up a little higher so that I was within reach of her. As I was doing so, there was a sudden, close, powerful rumble of thunder that came with no warning. I had not heard any distant rumblings of thunder prior to this, so it came as a surprise. There was no time to dawdle now. I pulled out a can of food and presented it to her. I gave her time only to sniff it before putting it in the back of the carrier. I held the open carrier up to her, but when I did so, she made some calls of distress. At first, I thought she was reacting to the carrier, but her problem instead was that her feet were slipping on the smooth bark as she stepped toward the carrier. 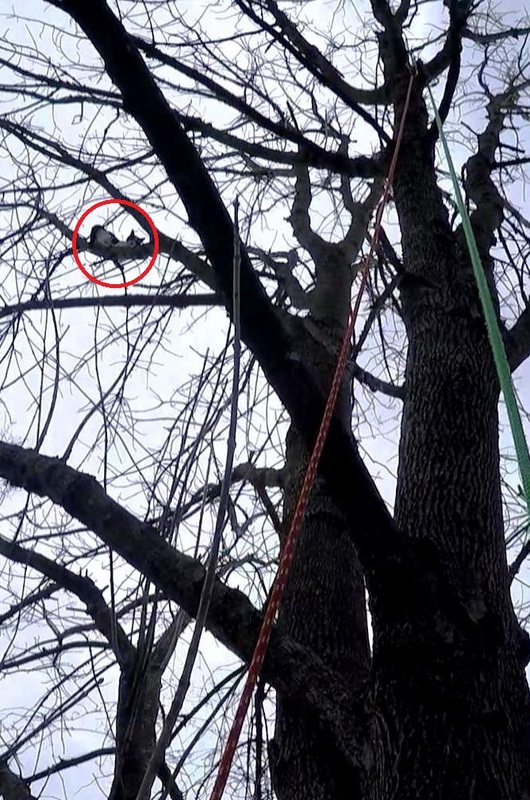 You can see her feet slipping in the video, and that may have served to encourage her to step into the carrier more quickly where she had better footing. She was a little reluctant to go fully inside the carrier, but after a little more encouragement, I secured her inside. As she was stepping into the carrier, the rain began to fall and another round of thunder rumbled through the air. Fortunately, the rain was light, and we were now done. All I had to do was go down as quickly as possible and pack up. Unlike last time, I did not have time to spend with Pepper afterward. She's a sweet cat, and I would have enjoyed that. Instead, I packed up as quickly as possible and headed home. On the way home, the storm really hit with full force: heavy rain, flash flooding, close and scary lightning. Driving home in that weather was the dangerous part, but I made it home safe and sound. And I am especially glad that Pepper did not have to endure the fury of that storm in the tree.